ABS-CBN, the country’s largest broadcast news organization, will provide 360-degree news coverage on different media platforms and deliver public service on-ground on Monday (May 13) when millions of Filipinos troop to polling precincts to cast their votes and choose their next batch of leaders. 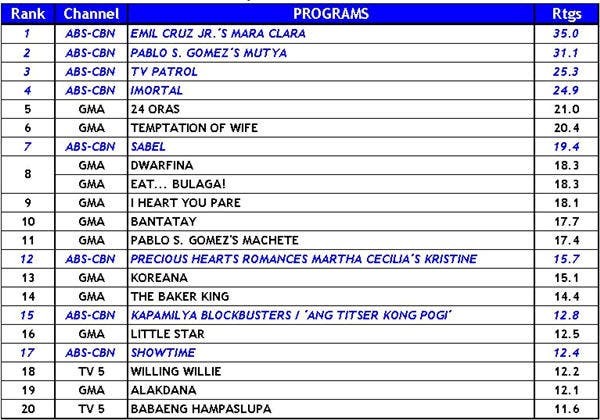 “It has become a company tradition for ABS-CBN to devote all of its resources to this important coverage. Technology has become more sophisticated through the years and we have utilized different tools in support of the coverage itself, but what hasn’t changed is our commitment to cover this political exercise and present all aspects of the polls as completely as possible,” said Ging Reyes, head of the ABS-CBN Integrated News and Current Affairs. Viewers can rely on ABS-CBN to give them real-time updates from its team of seasoned broadcast journalists ‘Kabayan’ Noli De Castro, Korina Sanchez, Ted Failon, Ces Drilon, Karen Davila, Julius Babao, Lynda Jumilla, Tony Velasquez, Anthony Taberna, Bernadette Sembrano, Pinky Webb, and Prof. Randy David who will deliver up-to-date news stories, vote count, and in-depth analyses of reports from over 30 live points in the country from 5 AM on Monday (May 13) to noon on Tuesday (May 14). ABS-CBN will also utilize augmented reality to help viewers understand reports better and an interactive map that will monitor the latest results and candidate information in key areas. Aside from giving groundbreaking news coverage, ABS-CBN will also put up “Bayan Mo, iPatrol Mo” stations all over the country where voters can ask information about their precincts and other poll-related concerns. The BMPM team will then link them to the authorized government agencies and groups. Moreover, the BMPM stations will serve as centers where voters in the area can file reports about election irregularities and problems and will have first aid personnel and equipment on stand-by to respond to medical emergencies. This public service effort anchors on the influence of BMPM and its half a million Bayan Patrollers who are prepared to share election-related information from their areas to ensure honest and peaceful elections. “Citizen engagement and the movement for change are a constant. Both of them go on even without an election. That’s how dedicated we are to the idea of citizen involvement and that is the reason we start really early,” said Reyes, emphasizing why ABS-CBN’s “Halalan 2013” coverage and “BMPM Tayo Na” movement were launched a year before the May 13 polls. 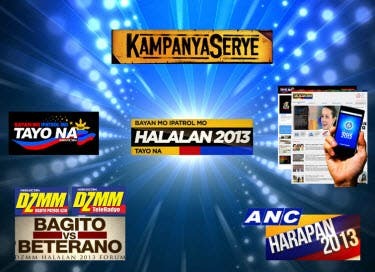 ABS-CBN’s “Halalan 2013” coverage is also defined by its “KampanyaSerye” documentaries, which made voters more involved and informed on some of the hotly contested local races, and the “Harapan 2013” live debates that gave all senatorial candidates a platform to present what they stand for. “KampanyaSerye” will swing into high gear on May 13, as ABS-CBN reporters reexamine the electoral rivalries featured in the series and highlight the results in areas like Manila, Masbate, Cavite, Cebu, among others. This aims to contextualize what the results mean to the electorate by putting the spotlight on the newly elected candidates to remind them of the promises they made during the campaign season. ABS-CBN’s “Halalan 2013” coverage was launched a year before the May elections to provide information to voters so they can make informed choices based on their vision for the country. Working hand in hand with ABS-CBN in this historic “Halalan 2013” coverage are the Commission on Elections, Department of Foreign Affairs Overseas Absentee Voting Secretariat, Parish Pastoral Council for Responsible Voting, Pulse Asia Inc., and Regional Emergency Assistance Communications System (REACT) Philippines, corporate sponsors Globe Telecom, STI College, Universal Motors Corporation, and MyPhone’s Solid Group, Inc. “Halalan 2013” also tapped The Philippine Star, Business World, Manila Bulletin, and Business Mirror as its print partners and Fully Abled Nation, Management Association of the Philippines, YouthVote Philippines, and Alternative Law Groups as its cause partners. Also joining ABS-CBN’s campaign for clean elections are educational institutions such as the University of the Philippines system, La Consolacion College, University of Sto. Tomas, Ateneo School of Government, and La Salle Institute of Governance. For the latest election-related news, watch ABS-CBN, ANC (SKyCable Channel 27), DZMM TeleRadyo (SkyCable Channel 26), Stduio 23, tune in to DZMM Radyo Patrol 630, or log on to ABS-CBNNews.com, dzmm.com.ph, bmpm.abs-cbnnews.com, halalan2013.abs-cbnnews.com or follow @ABSCBN_Halalan. sana walang dayaan ngayong halalan 2013 at sana ang ficos machine ay di maging tikas machine.